Judging from some of the comments in Roamer’s mailbox, the Reverend Richard Winter Hamilton’s (mostly!) warm reminiscences of his visit to Ireland in 1828, particularly to the Giant’s Causeway, made enjoyable reading. Another of the Northern Irish destinations that he enjoyed is here today, shared a century later by another well-travelled clergyman. The Rev Hamilton was the minister of Albion Independent Chapel in Leeds. 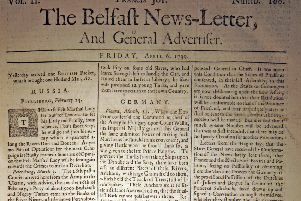 He was greatly impressed with Belfast – “it reminded me at once of Liverpool,” Hamilton recounted “it is a vast creation of commercial enterprise and luxury”. Almost a century later, another clergyman bestowed even grander praises on Belfast! Called Pleasant Places, the autobiography was published in 1934, and along with most of his 60 other books, Hannay wrote under a pseudonym – George A Birmingham. I’m embarrassed to admit that I’ve never read anything by Birmingham, or Hannay, and until a reader’s note arrived in my mailbox, I knew little or nothing about him! Unlike the Rev Hamilton, the Rev Hannay didn’t have to travel to Belfast. James Hannay’s paternal grandfather was from Scotland, but moved to Bushmills, where his father Robert Hannay was born in 1835. The family later moved to Belfast where James’ father was rector of St Anne’s. James was born on July 16th 1865, and when he was an infant his father hired a private tutor for him, Dr Drew, then the leader of the Orange Order of Northern Ireland. The little boy enjoyed sailing and was coached his father and grandfather on Belfast Lough. In later life when he was vicar of Westport, with money earned from writing books, he was able to purchase a boat – a Dublin Bay ‘Water Wag’. After school in Belfast and England he studied at the Divinity School of Trinity College, Dublin, where he graduated in 1888. A year later he married Adelaide Wynne, daughter of a Church of Ireland clergyman. “Our life together was one of unbroken and unclouded love from the day she first promised to marry me until God took her from me,” he wrote in Pleasant Places. After graduation Hannay was ordained as an Anglican minister and became a curate in Co Wicklow. He was rector in Co Kildare from 1918 to 1920 and served as a chaplain in France and Flanders during the First World War. Apart from being an army padre and a parish clergyman, and aside from his 60 books under the name of George A Birmingham, he was also a playwright, Gaelic Leaguer, public speaker, authoritative lecturer and was awarded an honorary Doctor of Literature in 1946 from Trinity College Dublin. He boasted other similarly distinctive accolades. Birmingham made history by celebrating the first Holy Communion service in the Irish Language on St Patrick’s Day in St Patrick’s Church of Ireland Cathedral in Dublin. He also administered Holy Communion at three very unusual locations during First World War, on consecutive Easter Sundays – in an ancient abbey refectory in Beaulieu, in the luxurious smoke room onboard the Lusitania and in a small YMCA hut. The latter, at five o’clock in the morning, was a very poignant memory for the Rev Hannay – “without any pomp and with the plainest ritual, with rows and rows of young soldiers kneeling on the bare floor. They had been confirmed a few days before by the Bishop of Northern and Central Europe”. Crossing the Atlantic in the Lusitania during the First World War wasn’t one of Hannay’s fondest memories, when Allied vessels were constantly in fear of prowling German U Boats. In spite of the protests of the ship’s steward, Hannay insisted on sleeping with his cabin door wide open. One of Hannay’s best known plays was ‘General John Regan’, a tale about a nationalist monument raised in Ireland by a returning American emigrant to a non-existent Irish hero. While being performed in Westport in 1914, where he’d been a vicar for 21 years, the play had to be stopped during the second act when angry protesters stormed the stage. Chairs were thrown, stage scenery was destroyed and the theatre itself was badly damaged. The riot ended only after the intervention of the parish priest, Father Canavan, who pleaded with the audience to stop. There’ll be more here soon about the Rev James Owen Hannay aka George A Birmingham, who died in London in 1950.